It was a fairly quiet year for the graphics department of AMD in 2018, but now that AMD has released the Radeon VII graphics card for gaming, 2019 is the year of the 7nm GPU. We have been left waiting for a new AMD graphics card for enough but the Radeon VII managed to get AMD back on the market again – although it continues to be dominated by Nvidia. Thanks to the new architecture of the 7nm GPU, AMD could put together its latest graphics cards with even more transistors than before, without increasing energy absorption. With the same price as the Nvidia GeForce RTX 2080, while offering comparable performance – although without the ray tracing or DLSS features of Nvidia Turing – Radeon VII has ensured that 2019 will be an exciting year for the best graphics cards. At CES 2019, AMD announced the Radeon VII, the first 7nm “consumer” graphics card. Launched on February 7th 2019, what we believe is the first of the Vega II graphics cards came with Devil May Cry 5, Resident Evil 2 and The Division 2. However, if you want to get your hands on this card, you could act quickly – AMD Navi cards may not appear until October, and Radeon VII is sold out to many suppliers. 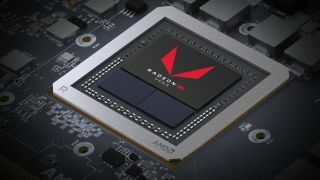 Right now there’s only one AMD Vega II card, the Radeon VII, and it was launched for $ 699 dollars (about € 622.35 euros), bundled with 3 games. We are confident that AMD will fill the range of cheaper GPU products in the future, but we do not know at what price. However, you can probably understand that it will be a direct competition with Nvidia Turing’s products. Switching from a 14nm to a 7 to a 7 process allows AMD to put more energy into each GPU. For its graphics cards, this change means even more transistors in each GPU without having to increase the energy requirements. And, the AMD Radeon VII is the first 7nm graphics card for gamers, with 3840 stream processors, 16GB HBM2 VRAM and width bandwidth from 1TB of memory per second. This directly challenges the Nvidia GeForce RTX 2080, which has 2944 CUDA cores, 8GB of GDDR6 VRAM and 448GB of memory per second for bandwidth. Radeon VII will definitely wipe out its competitor in some situations thanks to its power. But, in particular, it will do a great job for creative jobs, which means it will be the best video card for video creators and content that doesn’t have much money to spend on a professional product. It seems almost guaranteed that the Vega II series will find its way into lower-end mobile devices like integrated graphics processors. With a new generation of Ryzen processors coming, a new range of Vega graphics to be integrated into the APUs is perfect. Human verification (required): 2 + 6 = ?